There is obviously a significant difference between a prominent and an upcoming brand wherever you go. Ancheer is one of those iSUP brands that haven’t been around for a very long time. Although a fresh face, the Ancheer stand up paddle board seem to be well-liked. Accordingly, that makes the board at hand a potential winner in the industry especially knowing that it actually pushed through to the top without a shiny name. Nonetheless, how that affects you could be on both ends of the spectrum. So, to determine whether the Ancheer 10’ iSUP is made for you or not, we need to take you on a little close up tour. The size of a board is a determining factor and that’s why most companies out there like to take their time to create the board that everyone needs. However, what are the dimensions of this board. 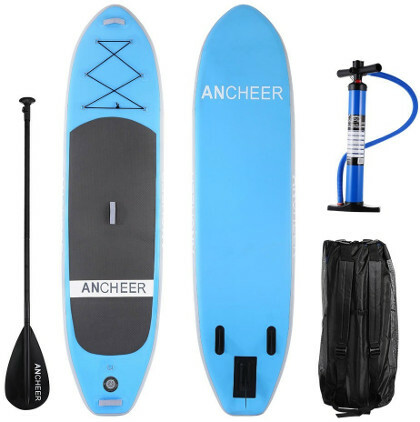 Well, ANCHEER figured that it cannot make a board that appeals to every single paddler out there but it can make one which covers the basics of a large portion of them. Accordingly, the brand decided to go with an encompassing 10 feet in length on this iSUP in order to represent as many paddlers as possible. Indeed, at this exact length, the ANCHEER is bound to make a nice fit for teenager, young adults and adult paddlers. Further, at 10 feet, the board grants equal importance to performance which is highly determined by its length to width ratio. Speaking of which, the width of the board at hand stands at a trust worthy 30 inches which is a universal number for balanced boards. Indeed, the length to width ratio kicks in effectively to induce the board’s stability, allowing you to balance yourself out nicely. Also, at this size, you’ll have plenty of room to move around without the risk of constantly falling off. Besides making a great diving platform, the ANCHEER is also thick enough to cater for a max load of 240 pounds. Such endurance can only be achieved via a 6 inches thick core which explains the great ratings of the board. 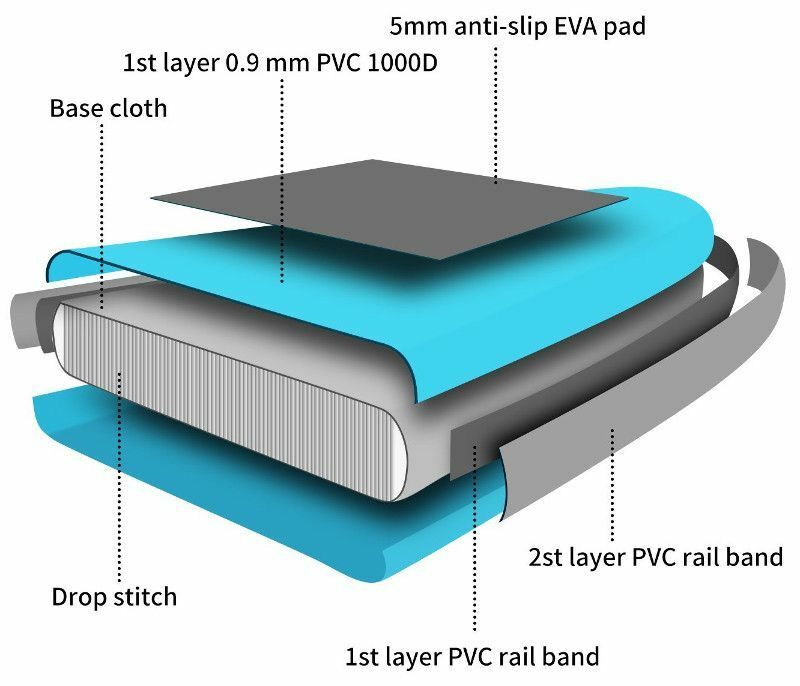 Indeed, at this thickness, the board is made capable of enduring so much more without bending at the center under excessive pressure which cannot be said about most low quality iSUPs out there. One of the biggest selling points of the ANCHEER is its rigidity which has been confirmed one purchase after the other. The ANCHEER at hand is thus made out of 0.9mm thick military grade PVC material which is one of the toughest materials out there. In fact, this is the same stuff that is used to build zodiac boats, river rafts, and some bullet-proof vests. Accordingly, the board at hand is made to be strong enough to endure the toughest environments. However, none of it would be achieved without the proper build. Indeed, the ANCHEER is made even stronger via an industrial drop stitch construction that pulls the core tightly together, leaving no room for accidents or punctures. Some of the best things about the ANCHEER are some of its features which in their turn make it one of the best Yoga paddle boards out there. Indeed, the board at hand can serve all the duties of an inflatable paddle board but it is primarily designed with a yoga in mind. Accordingly, the shape and design of the board is the biggest give away of its intent. The board is designed to grant you a familiar platform that is flat and symmetric in order to help you relax and remain balanced without much of an effort. Further, the board also features a necessary gripping pad which covers most of the surface you’ll be generally using. The anti-slipping pad will not only enhance your stability and balance on top of the board but it will also grant you a firmer grip and consequently command over it. Right on top of the pad, the board features a neat little cargo net, consisting of 6 stainless steel D-rings connected via a bungee cord. The net will come in very handy to secure anything from your shoes to your paddle, allowing you to roam hands free without a single concern. To wrap it up, the ANCHEER AS10 exhibits practical set of carry handles distributed on the extremities and center of the board in order to enable the paddle to carry the board individually on land & get some help when needed. Undeniably, the ANCHEER AS10 is a recreational board but how much is that going to affect its performance? Well, the ANCHEER is definitely not a racing board as it is primarily developed to be as serene and peaceful as possible in order to embrace yoga masters. Nonetheless, the board at hand is still considered to be pretty advanced which is translated through its pointy lifting nose, wide and stable hull, tight reactive tail and exceptionally responsive triple navigation system. Speaking of which, the navigation system on this board is just great as it comes with a large central fin and two smaller tracking fins. The central fin is going to make it easier for you to navigate the board while the smaller ones keep you in a straight track. The Ancheer AS10 10′ iSUP is a great budget-friendly inflatable paddle board. It’s quite stable and it tracks well. 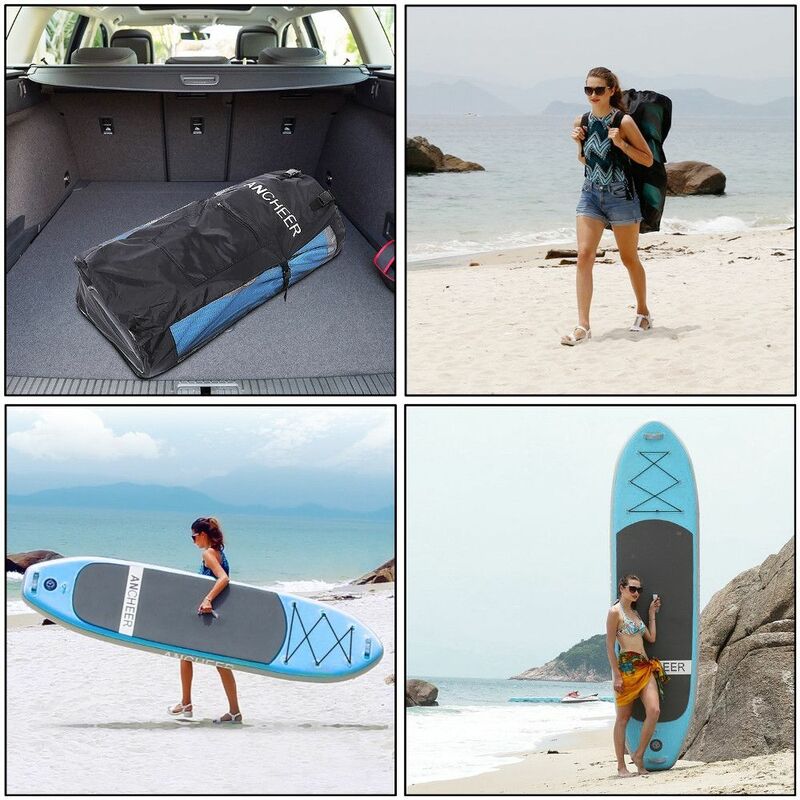 It’s designed to be a versatile recreational paddle board. Its curved design allows for for all-round SUP”ing on flat water and light wave surf.